This is one of our favourite segments on our blog. We interview real brides who have been there, tied the knot & we ask for all their best advice from their wedding. Today, we're featuring Logan Hill's best wedding day advice. Logan purchased her gown from OUTW & got married on September 12, 2015. She looked amazing in her gown and we cannot wait for you to read her words of wisdom. What is the biggest piece of advice you would give a newly engaged bride-to-be? Don't sweat the small stuff! Whatever is not done by the day of, is not important and no one will notice, and/or care. Easier said than done :) But worth trying, for sure! What is the best advice you would give for a bride-to-be who is searching for her dream dress? Just try on whatever they suggest. Even if you hate it, at least you tried, and it may be a style that actually looks good on you. What is the best advice you were given as a bride-to-be? What is something you regret when wedding planning? Listening to everyones ideas and opinions. It makes it confusing and frustrating. Just do what you want. What is one thing you're glad you did when you were planning your wedding/engaged? Made all the centre pieces myself. Then It was what I wanted and if they didnt look great it was my fault. Knowing how hard I worked and having some not turn out made it easier to just " meh oh well". Its just a centre piece...it's not the end of the world. Is there anything else you'd want to tell a future bride? Have good food, good music/dj, and a dress you feel great in. That is all anyone remembers. The food, the fun, and the dress. Some wise words from Logan. Thanks for sharing with our brides-to-be! We love sharing advice from real brides who have already walked down the aisle. If you'd like to share some click here! If you're still looking for your perfect gown, book your personalized bridal appointment here. Photographs by Alisha Martens Photography. Real Bride | Kelsey's Say Yes Story! 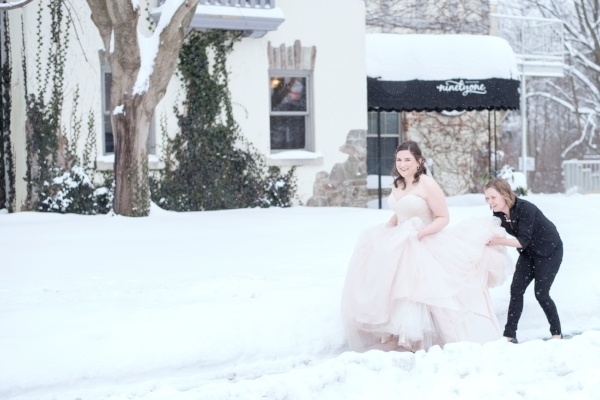 Today, as part of our Real Bride feature, we get to tell the story of how Kelsey said Yes to the Dress at OUTW. She came to the store on February 21, 2017, just under a year away from her wedding day. It was the second gown she put on. 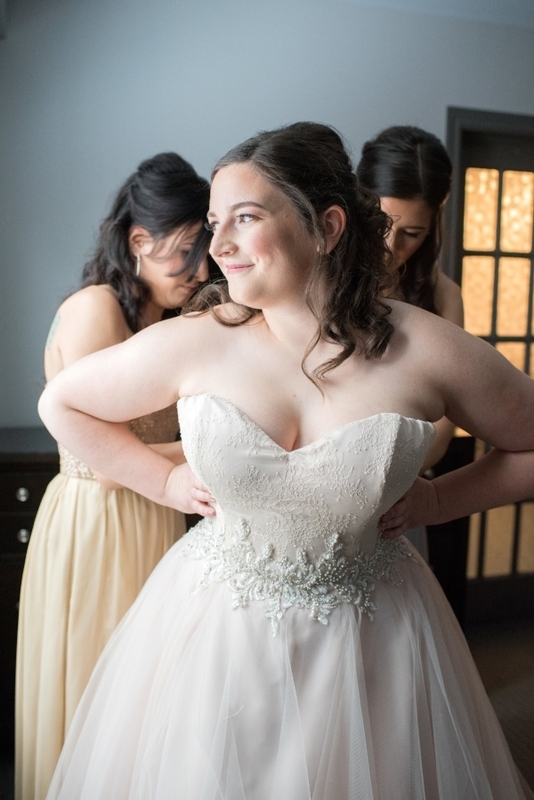 She tried on several more at OUTW before saying yes to make sure she felt confident in her decision, but nothing quite compared to the one she loved! She made a beautiful choice & was such a beautiful bride. Here's her story. No. OUTW was my first and last store! I was ready to buy, but also prepared not to get down on the experience if I didn't find my perfect dress. It wasn't necessarily an extra influence, but it really helped having Michelle there to talk about how the dress would photograph! This next question is one of our favourites. We love asking our brides this because it's a great reminder that no brides are going to have the exact same Say Yes Story. Every bride's is different and we love embracing that uniqueness at OUTW! Not even close! I came in with the idea of an ivory long sleeve, fitted lace gown and left with a strapless blush ballgown! Kelsey's maids purchased their gowns from OUTW as well. This is what she says about that second experience back in the store. It was just as great as the first! Sharon was able to have me wear the stock gown of my dress to see how they would all look together which really helped us see the big picture. Shout out to wedding planner, extraordinaire, Amy of Unmistakably You, pictured here doing her thing with Kelsey! It is so hard to put it into words! I have never experienced anything like it before. Sharon was our consultant and she felt like someone we had known forever by the time we left. She put up with my indecisiveness and gave some great suggestions. It was so easy to trust her! When I was unsure about the gown I ended up purchasing, she talked me through how I was feeling and reassured me when I was nervous. It would have been impossible without her help. We've loved walking through Kelsey's Say Yes Story today on the blog. Join us next Wednesday as we walk through Kelsey + Greg's wedding day. If you need to write your Say Yes Story, click here to book your bridal appointment. If you're an OUTW bride + you're already married and would like to be featured on our blog, email us today at info@onceuponatimeweddings.ca. All pictures the work of amazing Michelle A Photography.